Non-Butyl, alkaline Tile and Grout cleaner that cuts through dirt and grease with ease. Your customers will love how Anomaly slices through grease and soil like butter. You and your technicians will love the fact that it is completely free of butyl. Use on ceramic tile, porcelain, tile & grout, brick and concrete. Great for natural stone such as marble, granite, limestone, travertine, slate, terrazzo & sandstone. 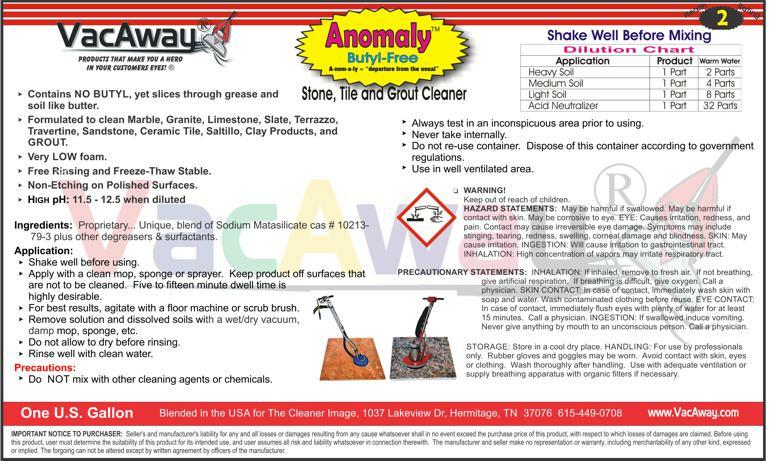 For more information see the technical bulletin, MSDS and label.